The HSCAP Sports Second Allotment Results 2017 has released. Candidates seeking admissions through Sports Quota for the academic year 2017-18 can now check their allotment (district wise) through login. Students who had applied for the examinations can results Pdf is available in the online. Now, aspirants need to check Kerala HSCAP Plus One Sports Second Allotment from the official website at hscap.kerala.gov.in. 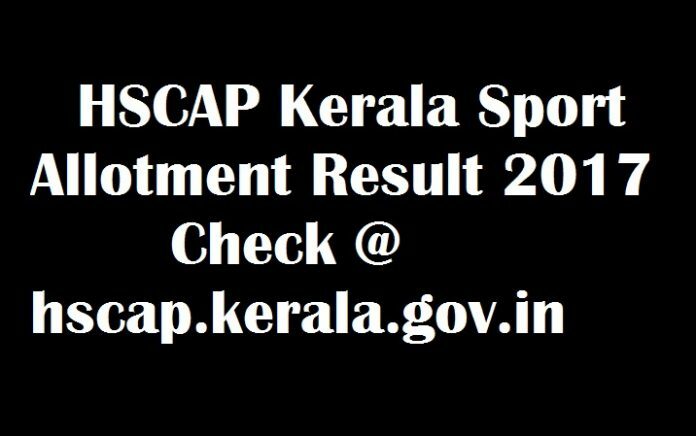 As per the schedule, HSCAP +1 Sports Quota Second Allotment Result has declared Today on June 23 at its respective online web portal at hscap.kerala.gov.in. Now, the active link of Sports Allotment Result is available at the end of this article. Candidates have to visit the online portal and have to provide log in details Roll Number & DOB to check the allotment. Recently, the Department has released the notification and invited Online Application of the first year HSE admissions into various courses. A huge number of candidates submitted their applications. The Single Window System for Higher Secondary Admissions has uploaded HSCAP Sports Second Allotment Results 2017 on its official portal at hscap.kerala.gov.in. Candidates soon after checking the Kerala HSCAP Plus One Sports Second Allotment, report the concerned College or Institute for Admissions on or before June 26 at 5 PM. In case if anyone is not aware of checking the results can follow the procedure that has given below. The district-wise vacant seat allotment results of Sports Quota for admissions are available now. Finally, more details regarding HSCAP will furnish soon. Log on to the official website at hscap.kerala.gov.in.